The dispossession of people from the Highlands and rural Lowlands of Scotland cannot be dissociated from the emergence of the country as a modern nation. This is the baseline for the importance invested by Devine in his subject matter, an event that continues to haunt the Scottish consciousness and one which belies the tourist image of the Highlands as a great empty wilderness where few people ever lived (à la Zionist descriptions of pre-colonial Palestine as empty and desolate). In reality, of course, the Highlands was populated by numerous townships and farming families who had toiled on the land for generations. 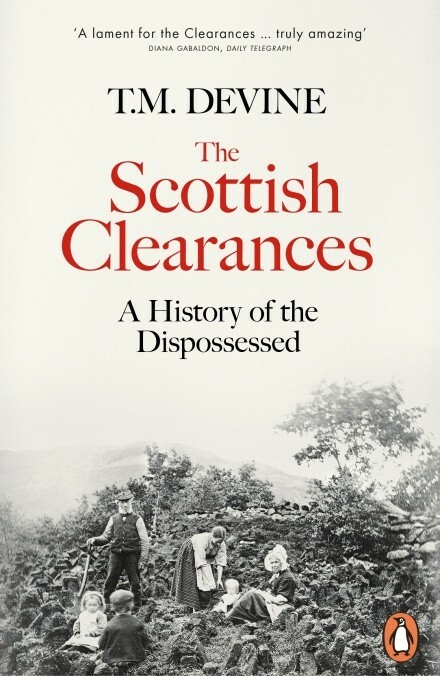 But Devine questions the commonplace assumption – given undue credence by books like John Prebble’s The Highland Clearances – that the dispersal of people and the consequent sense of betrayal and loss can be laid solely at the door of hard-hearted lackeys and the greedy landlords, former chieftains of the clans, whom they served. The book’s argument is that the Clearances have a multi-layered genealogy, one not reducible to loose talk of ethnic cleansing. Nor is it one, contra the view obtainable from most recent scholarly literature on the topic, confined to the Highlands. Celebrations of Highland culture in literary traditions, not to mention the Outlander fantasy series and Scotland’s ‘Roots Tourism’, contribute to a marginalization of the rural Lowlands. What Devine calls ‘the boring reality’ is that most Scottish emigrants who crossed the Atlantic came from the Lowlands, not driven there by post-Culloden repression and perfidious landlords but lured by the prospects of a better life in North America. The Scottish Clearances sets out to compare and contrast how the two regions, Highlands and Lowlands, underwent a violent and historical transformation. The experience for those living through it was to bear witness to dispossession on a scale never previously imagined. An old world passed away and in little over a hundred years Scotland had become a different country. The callousness and violence of forced dispossession has been well chronicled but not the differing chronologies and all-important regional differences that were interwoven with social and economic dynamics underlying the historical phenomena. These included: rent increases and a growing intolerance by landlords to accumulating arrears; harvest failures and potato blight which did not receive remedial response; leases to sitting tenants being relocated to crofting townships; illicit whisky making being targeted by the authorities; and new opportunities beckoning overseas or in towns. In the Highlands, schemes of ‘compulsory emigration’ were introduced and – anticipating current Tory welfare policies – racist and class attitudes came into play with newspaper talk of feckless Celts who needed shock treatment. Three inches [of flesh] out of your lungs. Devine is far from denying the cruelty and poignancy of forced evictions but he draws attention to factors that complicate a reductive approach that opts for ‘a single explanation of human wickedness’. These include the effects of a rising population – ‘a dominating factor in the social history of the Highlands’ – on poor land where people’s subsistence farming rendered them more vulnerable than ever before; bankruptcy of the old landed class; ‘the absence of any viable alternative to pastoral husbandry’; and the encroaching power of market capitalism. In chapter 27 of Capital, Marx, cognisant of what may have been the most significant factor, lambasts the tyranny of the market that fuelled the expropriation of Scottish peasants’ land. Marshalling original sources for its wealth of information and nuancing the material with empirical exactness, this book, complete with evocative photographs, could be called revisionist history but, if so, it is a refreshing and welcomed example of the intelligent and lucid kind. Sean Sheehan is author of ‘Žiżek: A Guide for the Perplexed’ (Continuum, 2012) and’ A Guide to Herodotus’ Histories’ (Bloomsbury, 2018).